Takeaway: Tapping into your mental state can help you strengthen and improve your asanas. Try these tips to tap into your mental strength and enhance your Virabhadrasana (Warrior) Series. The Virabhadrasana series, also known as the Warrior asanas, are a fundamental part of Astanga yoga and many other schools of yoga. When I first started my practice, I found the Virabhadrasana series more approachable than some of the more advanced and intimidating postures. Warrior one, two and three helped me build strength and connect with my body, mind and soul on a deeper level--ultimately helping me to evolve my practice into what it is today. Since Virabhadrasana are standing postures, I was able to root myself into the mat, focus on my balance and become more aware of my body. As the name connotes, the Virabhadrasana asanas are meant to be symbols of strength, and are named after the powerful Hindu warrior Virabhadra. Furthermore, the Virabhadrasana asanas have benefits that go beyond just improving your physical strength. If you’re new to yoga, use the Virabhadrasana series as a way to familiarize yourself with yoga postures and to explore your body on a more intimate level. If you’ve been practicing for years, I invite you to explore some of these tips to help elevate your practice. 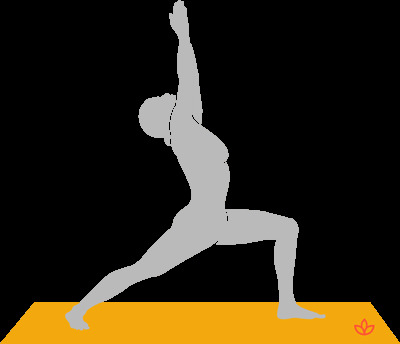 This asana begins in a lunge with the front knee at a 90-degree angle and the back toes at a 45-degree angle. Root the feet into the mat and square the hips. Raise the arms overhead with the palms facing each other. Physically, Virabhadrasana A is beneficial for strengthening the glutes and hamstrings, improving balance and opening the upper body. If this asana is a staple in your yoga practice, you may wish to delve deeper and look at ways to improve this seemingly simplistic posture. To achieve this, I usually look inward. For example, I went through a phase where I was more reserved. I used Virabhadrasana A to help open my heart chakra and develop my confidence. When I rooted my feet into the mat, I allowed myself to feel like had a powerful presence in the room. When I held onto this mental state after I stepped off the mat, I noticed how impactful this could be on my mental state and confidence. It’s easy to be complacent when we’ve done a posture numerous times. To deepen this asana, I tend to focus on my alignment. Are my arms straight? Are my fingers fully engaged, either squeezed together or spread wide apart? How powerful is my gaze? Are my shoulder blades creeping up to my ears? I always try to turn my muscles “on” just a little bit more each time. Focusing on the smaller aspects of the pose helps me to stay focused, and also to improve my asana. As always in yoga, it also helps to connect with your breath in this pose. If you find your legs aching or your arms shaking, come back to your breath. This will help you stay present and connected to the posture. Also known as flying warrior, this asana symbolizes the warrior attacking the enemy. 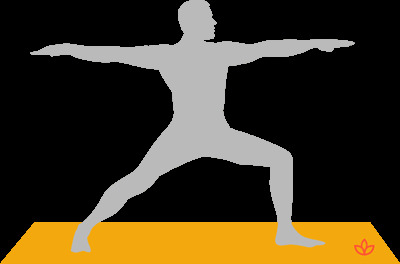 Starting in Virabhadrasana A, tilt forward from the hips. Slowly extend the back leg, lifting the toes off the mat, while also lifting the arms up by the ears. You want to make a straight line from the tips of your fingers to the tips of your toes. Aside from the obvious physical challenge of balancing on one foot, you also engage the hamstrings, glute muscles and stretch the spine. The abdominals are also fully engaged since stability is being called into question. One of the first times I saw my teacher demonstrate Virabhadrasana C, I remember thinking, “That looks easy. I’ll have no problem doing this pose because of my dance background.” A few minutes later, my body was challenged beyond belief and it took a lot to not want to give up. For me, this asana is important for staying grounded and focused in the midst of discomfort. To improve this posture, try tapping into your mental energy. Send the mind elsewhere to try and distract it from this challenging posture. Release all the tension that doesn’t serve you. Ground yourself into the Earth. While the Virabhadrasana may seem like familiar, fundamental yoga poses, allow yourself to go beyond the obvious physical benefits these asanas provide. Just like I witnessed in my own practice, you can use these postures to tap into your mental strength as well as your physical strength. The next time you’re on the mat and practicing this graceful series, notice where you hold onto tension. Recognize where you feel strong and grounded. Ask questions and challenge yourself so you can achieve your best Virabhadrasana series.